We’d love your help. Let us know what’s wrong with this preview of Day Of Deceit by Robert B. Stinnett. In Day of Deceit, Robert Stinnett delivers the definitive final chapter on America's greatest secret and our worst military disaster. Drawing on twenty years of research and access to scores of previously classified documents, Stinnett proves that Pearl Harbor was not an accident, a mere failure of American intelligence, or a brilliant Japanese military coup. By showing tha In Day of Deceit, Robert Stinnett delivers the definitive final chapter on America's greatest secret and our worst military disaster. To ask other readers questions about Day Of Deceit, please sign up. Lot of rehashing of information from chapter to chapter, but it makes a very very good case. FDR initiated a plan to force Japan into war with the US. We had broken all the Japanese codes. We knew they were on the way. The Admiral for the Pacific Fleet was not recieving key information that others recieved. The Governement instructed the fleet that all ships were to stay out of the Northern Pacific, the regular shipping route, two weeks before the attack. Reco Lot of rehashing of information from chapter to chapter, but it makes a very very good case. FDR initiated a plan to force Japan into war with the US. We had broken all the Japanese codes. We knew they were on the way. The Admiral for the Pacific Fleet was not recieving key information that others recieved. The Governement instructed the fleet that all ships were to stay out of the Northern Pacific, the regular shipping route, two weeks before the attack. Recon planes were told to reduce their radius and cut the number of flights. Newer ships were moved to the south leaving only old World War I vessels in the harbor. And on and on. I have long believed that our government lies to us and then lies to us about lying to us....this book convinced me my suspicions were correct. Although at time the book saddened me it was exceptional with regards to the subject matter. If you are interested in how the war really began and what roll Washington had in hiding the details then this is a book you wont want to miss. I was a schoolchild during WWII and remember well the day Pearl Harbor was attacked. Many of us wondered at the time how could the Navy have been surprised so completely. Stinnett has done some yeoman's work in researching this book. He has been stonewalled by the political and military bureaucracy for more than a decade trying to get the true information. He has put together some pretty convincing facts from people who have the truth. Some of the data has been classified as Secret to prevent hi I was a schoolchild during WWII and remember well the day Pearl Harbor was attacked. Many of us wondered at the time how could the Navy have been surprised so completely. Stinnett has done some yeoman's work in researching this book. He has been stonewalled by the political and military bureaucracy for more than a decade trying to get the true information. He has put together some pretty convincing facts from people who have the truth. Some of the data has been classified as Secret to prevent him getting ironclad proof of the duplicity of Roosevelt and some senior military commanders. It has been over a half century since the attack. I am pretty sure the secrecy is no longer required on the data. It now obvious that the truth is being withheld from the people. I have always been dubious of previous reports that Roosevelt knew in advance but Stinnet has now convinced me that Roosevelt lied to us. With more than 60 years of coverup by the government on this attack I have very little faith that we will ever get the true story of the Benghazi attack from this Obama administration during my lifetime. Some might come away from this book thinking that FDR had knowledge that Japan would be attacking the USA. However, as with many accusations of a conspiracy, this is merely looking at the signs of an attack after the event has occurred. Putting the pieces together after the event are very easy if you know exactly what to look for. It's a very different thing to determine if an attack is imminent if the event has yet to happen. Also, contrary from derived from the title of this book, I do not thin Some might come away from this book thinking that FDR had knowledge that Japan would be attacking the USA. However, as with many accusations of a conspiracy, this is merely looking at the signs of an attack after the event has occurred. Putting the pieces together after the event are very easy if you know exactly what to look for. It's a very different thing to determine if an attack is imminent if the event has yet to happen. Also, contrary from derived from the title of this book, I do not think the author's intention was to illustrate undeniable evidence that the administration at the time of the attack had implicit information that they could have acted upon. As with any large organization, all it takes is one person to set aside a message that is that one piece of the puzzle that will allow the decision makers to choose a prudent course of action. The effectiveness of a chain of command is usually determined by it's weakest links. The ability to get all of the pieces together in one place was not done in this case. There is so much detail in this book that I tried repeatedly to skim it, but I could not. I am not an avid reader of military history, but I found this one thoroughly engrossing. The main questions and conclusions are clear from the beginning, so this reader's delight was not in the story but in Robert Stinnett's exhaustive research. I would not wish the job of editing his personally typewritten manuscript on anyone, and the reader must tolerate some organizational problems and redundancies, but There is so much detail in this book that I tried repeatedly to skim it, but I could not. I am not an avid reader of military history, but I found this one thoroughly engrossing. The main questions and conclusions are clear from the beginning, so this reader's delight was not in the story but in Robert Stinnett's exhaustive research. I would not wish the job of editing his personally typewritten manuscript on anyone, and the reader must tolerate some organizational problems and redundancies, but I think I would have enjoyed simply poring through all the author's research notes. What a treasure! My active duty experience began two decades later, but my exposure to naval communications and intelligence made the meticulous log-keeping quite real. Same for the nature of summary reports to the flag level. Didn't you always want to know how Pearl Harbor could be attacked without any defence? Now we know.......Roosevelt knew, and he not only let it happen, he moved the Northern Fleet out the way so the Japanese could get within range. A MUST READ to understand Vietnam, and Iraq. This is a book with interesting points. It is written very didactically, determined to make you see the author's point. The author includes only documents that prove his point, and excludes many others. I felt that it was like many conspiracy books, very one sided and incomplete. Question: What do these incidents have in common? That the good side was viciously and deceitfully attacked by the forces of evil? If your natural response goes something along these lines you really need to read this book! Although this is a very well documented and extremely important book for finding the truth in history what I find strange is the assertion from the auth Question: What do these incidents have in common? Although this is a very well documented and extremely important book for finding the truth in history what I find strange is the assertion from the author that Germany was a threat to America at the time. 1.All of continental Europe was under the military control of the German* Italian Axis. 2.Only the British Empire actively opposed the growing world dominance of the Axis powers. 3.Axis propaganda successfully promoted American indifference to the European war. 4.United States security in the Western Hemisphere was threatened by the Axis fomenting revolution in Central and South American countries. 5.Upon the defeat of England, the United States could expect an immediate attack from Germany. The notion that the third Reich was a threat to US security is completely absurd even in the event that Britain were defeated. Germany had a tiny coast line and where based on ground forces as the Kaiser had attempted to build a High Seas Fleet to challenge the Royal Navy had been a catastrophic failure. If Germany was not a threat to Britain at sea how could it be a threat to America? How could this possibly be a threat to America and its more than a thousand warships? Further there is no indication in third Reich propaganda/policy/writings that Germany had any intention to invade the US, but there are overwhelming evidence to the contrary. It is obvious that the third Reich saw Bolshevism as the main enemy, that the German nation had been mistreated by Versailles, and that the main objective was to return the many Germans now living under tyrannical conditions as a result of that to the Reich. It is clear that what Hitler demanded was restoration of what had been taken from Germany at Versailles. So how could such a massive miscalculation take place by the US government? There is absolutely no way (or will) for Germany to threaten America at that time. And if they had, why not pressure Britain to drop the unconditional surrender stance and accept one of numerous German peace offerings (What the World Rejected: Hitler’s Peace Offers 1933–1940 by Dr. Friedrich Stieve) instead of provoking Japan to attack pearl harbor, killing roughly 3000 Americans – putting x amount of Japanese living in America in concentration camps – sending x amount of American soldiers to Europe to die and kill x amount of Europeans and destroying Europe – and dropping the H-bomb on Japanese civilians? An interesting perspective on the attack, this limits its scope to the signals intelligence that has been suppressed and/or unavailable to historians and researchers in previous examinations of the Pearl Harbor attack. He provides a somewhat compelling case that certain military and civilian officials were engaged in a systematic effort to force Japan into the first overt act of war based on an 8-point plan written by a naval officer 14 months before the attack. He documents the creation and dev An interesting perspective on the attack, this limits its scope to the signals intelligence that has been suppressed and/or unavailable to historians and researchers in previous examinations of the Pearl Harbor attack. He provides a somewhat compelling case that certain military and civilian officials were engaged in a systematic effort to force Japan into the first overt act of war based on an 8-point plan written by a naval officer 14 months before the attack. He documents the creation and development of radio intercept stations, their capabilities and records, as well as analyses provided by operators trained to predict Japanese movement and intentions. Much of his information is new (at the time of publication), and shows how it is possible that information withheld from Short and Kimmel in Hawaii could have helped them make better decisions and be more prepared for the attack. He also demonstrates that policy-makers in Washington who did have access to that information should have provided more specific direction to Kimmel and Short, especially regarding the text of intercepts that clearly demonstrated Japanese intentions to start a war with the United States. Unfortunately, he does not balance his analysis with adequate explanations as to why personnel manning intercept stations in Hawaii did not provide enough information to their superiors. This is a problem because he seems to imply that they were a part of the conspiracy to force Japan into the first overt act of war, but he does not provide any evidence that they were knowing conspirators, as opposed to persons whose actions simply enabled the attack to be more successful than it should have been. There is little to no documentation that specific actions performed at intercept stations in Hawaii and the rest of the Navy's Pacific network were deliberate, or were simply taken advantage of by policy-makers in Washington, DC. If you love conspiracy theories, or if you think that FDR was actually a crappy president (woot! I fit both those categories!) you will enjoy this book. Honestly, I think that Stinnett did a good job with this book. It is a *bit* conspiracy-theory-ish, but not in that overboard I’m-writing-this-from-an-undisclosed-location-so-I-don’t-get-killed kind of way. Basically, Stinnett’s premise is that FDR wanted our country to be involved in World War II, and so he did everything he could to (a) provoke If you love conspiracy theories, or if you think that FDR was actually a crappy president (woot! I fit both those categories!) you will enjoy this book. Honestly, I think that Stinnett did a good job with this book. It is a *bit* conspiracy-theory-ish, but not in that overboard I’m-writing-this-from-an-undisclosed-location-so-I-don’t-get-killed kind of way. Basically, Stinnett’s premise is that FDR wanted our country to be involved in World War II, and so he did everything he could to (a) provoke Japan into attacking, (b) to make sure that Pearl Harbor was an available target, and (c) (and perhaps most controversial) ensure that the service men and women at Pearl Harbor would be taken by surprise by an attack. Now, as I’ve already mentioned, I’m not a fan of FDR. I was drawn to this book because other (more neutral) readings about World War II have made me a bit leery of FDR’s attitude towards war. Just reading his speeches and such during the year before Pearl Harbor, he doesn’t sound like a man who truly wants to stay out of a war. Day of Deceit confirms that concept – FDR realized that our country could be pulled out of the Depression and into a position of great world power if our entry to the war was timed correctly. Recommends it for: Honest Americans and historians. Recommended to Bliss by: An article by James Perloff. Perhaps the most important book written about World War II as it defines the betrayal of our sailors and soldiers stationed at Pearl Harbor by the president of the USA, Franklin D. Roosevelt, as he kept secret his knowledge of the translations of decoded messages from Japan's Navy and Diplomatic corps. Robert Welch, the founder of The John Birch Society, had revealed the treason of Franklin D. Roosevelt in 1954 in a letter to friends that was later published at "THE POLITICIAN," and Robert Stinne Perhaps the most important book written about World War II as it defines the betrayal of our sailors and soldiers stationed at Pearl Harbor by the president of the USA, Franklin D. Roosevelt, as he kept secret his knowledge of the translations of decoded messages from Japan's Navy and Diplomatic corps. 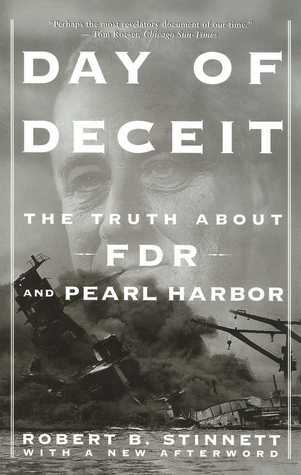 Robert Welch, the founder of The John Birch Society, had revealed the treason of Franklin D. Roosevelt in 1954 in a letter to friends that was later published at "THE POLITICIAN," and Robert Stinnett's excellent book, entirely vindicates Robert Welch's assessment of Pearl Harbor and the betrayal behind FDR's prior knowledge and lack of warning to our general and admiral stationed at Pearl Harbor in 1941. Understanding that President FDR wanted badly to draw America into war with Adolf Hitler and hadn't been able to, so found a back door approach by goading the Japanese into attacking our Pacific fleet and keeping Admiral Kimmel in the dark about the approaching attack, is important for all Americans if they are to understand our involvement in World War II. Knowing that a single man, a president of the USA, would betray his own armed services in order to allow a "surprise attack" on our naval base, so he could supply Congress with a reason to declare war on Japan and Germany, and having proof, is most important to understanding the machinations of powerful men who sit in the White House and get away with murder. FDR should be stripped of all acolades by all future generations of Americans. I am enjoying it. It get's a little bogged down in details but it does have to prove the point. I should question what he is saying but I don't. This is the second time I read this book. I was prompted to do that after reading “No Ordinary Times” by Doris Goodwin Kearns. I remember feeling a great deal of anger at FDR after reading the book the first time. Not so much this time, as I have a better understanding of the motivation and the quandary that Roosevelt was in. T his is a well researched, well written book. I found that trying to keep up with the various intercepted codes and agencies doing that, a bit of a challenge. There have be This is the second time I read this book. I was prompted to do that after reading “No Ordinary Times” by Doris Goodwin Kearns. I remember feeling a great deal of anger at FDR after reading the book the first time. Not so much this time, as I have a better understanding of the motivation and the quandary that Roosevelt was in. There have been rumors for a long time that the U.S. had prior knowledge of the Japanese attack on Pearl Harbor. The author(Stinnett) went a long ways in providing evidence of that fact. He makes a strong case that the Unites States knew an attack was coming, did not prepare for it and in fact he learned that the North Pacific area where an attack was believed likely to come from was deemed to be a “vacant sea”, weeks before the attack and worse . . . patrols were forbidden in this area. The guts of the book makes the case that the attack on Pearl Harbor was deliberately set up (actually one of 8 sites where they tried to tempt Japan to attack) the administration to unite this country and bring us into the war. There is a policy memo written by Lt. Cdr. Arthur McCullum citing eight acts that were designed to create Japanese military action. Among those were to block thesale of oil to the Japanese, Keeping clear U.S. military presence in the Pacific and open support of Chiang Kai-shek in China. After reading most of the book, it is very clear – to me at least – led to the sneak attack on Pearl Harbor. The auhor has clearly done extensive research – used newly declassified documents (though the Navy still has a number of documents classified and given the preponderance of evidence not available, it literally re-writes the record of WWII. Once all documents are declassified, there rewriting may well be even more extensive. Using documents through the Freedom of Information Act during 17 years of research, Stinnett provides clear evidence that FDR and his top advisers knew that Japanese warships were heading toward Hawaii. The most difficult part is that the author argues that FDR, who wishing to move sway public opinion in support of U.S. entry into WWII, created and followed a clear policy provoke a Japanese attack. This plan is made clear in a U.S. Naval Intelligence secret strategy memo in October 1940. FDR began implementing its eight steps (which included deploying U.S. warships in Japanese territorial waters and imposing a total embargo intended to strangle Japan's economy), all of these things –writes the author – resulted in the Japanese attack. Stinnett, who is a decorated naval veteran of WWII who served under then Lt. George Bush, supports his claims with a wealth of documents, which includes a host of government and military memos and transcripts. For many years it was maintained by our government and the Navy that the Japanese fleet maintained strict radio silence. Not so. He provides a number of Japanese naval broadcasts, intercepted by American cryptographers between Thanksgiving of 1941 and December 7th. And that it was Pearl Harbor that was to be targeted. The author also shows – convincingly - to me at that the U.S. Navy folks in Hawaii- kept Pacific Fleet commander Adm. Husband Kimmel and Lt. Gen. Walter Short. This was clearly directed from Washington. Then those two gentlemen were used as scapegoats – for failing to be prepared for the attack. I should note that the U.S. Senate cleared their names in May of 1999. At one point, Admiral Kimmel moved his fleet into the North Pacific to search for the suspected Japanese staging area, but naval headquarters made him turn back. A damming fact. This book does raise serious ethical issues with regard to FDR and his administration. I find this very deceitful – even on the 2nd reading. On the other hand, I can see the dilemma that FDR was in. The dilemma was how to rouse the nation to fight a war that we must be involved in. Roosevelt’s relationship with Churchill was a driving force in this as he did not want to see Great Britain fall to the Nazis. He was forced to find some creative way to get us involved even while saying that no American soldiers would fight in a foreign war. I say I can understand. But I do not absolve him, either. At the very least Kimmel and Short should be publically cleared of the charges by a full congressional act and the Navy needs to be a part of that, as well. To not do that leaves this whole sneak attack a lie, which it was not. It was created by FDR and his administration irrespective of the motivation. It was – in the final analysis, immoral. Stinnett makes a very good case that FDR, George Marshall and other top civilian and military leaders allowed Pearl Harbor to be attacked to force a change in American public opinion away from "isolationism." Having been interested in Pearl Harbor since I was very young, I've read many books about the subject and have always been suspicious of the "surprise attack" story. John Toland's book, published in the 1980s, was very powerful, but Stinnett uncovered new evidence that pretty much proves it Stinnett makes a very good case that FDR, George Marshall and other top civilian and military leaders allowed Pearl Harbor to be attacked to force a change in American public opinion away from "isolationism." Having been interested in Pearl Harbor since I was very young, I've read many books about the subject and have always been suspicious of the "surprise attack" story. John Toland's book, published in the 1980s, was very powerful, but Stinnett uncovered new evidence that pretty much proves it in my mind. Also, Admiral Kimmel and General Short need to have their names cleared. Un veterano della guerra si domanda se ai vertici delle nazione non avessero preso in considerazione l'idea di far entrare gli Stati Uniti in guerra con quel fervore tutto americano che solo loro riescono a sfoggiare quando c'è da vendicarsi (del tipo: "ricordatevi di Alamo! ", "ricordatevi di Custer! ", e poi "ricordatevi di Pearl Harbor!"). Attraverso una serie di documenti desecretati Stinnett mostra una serie di fatti che sembrano paventare appunto questa idea: gli Stati Uniti hanno venduto pe Un veterano della guerra si domanda se ai vertici delle nazione non avessero preso in considerazione l'idea di far entrare gli Stati Uniti in guerra con quel fervore tutto americano che solo loro riescono a sfoggiare quando c'è da vendicarsi (del tipo: "ricordatevi di Alamo! ", "ricordatevi di Custer! ", e poi "ricordatevi di Pearl Harbor!"). Attraverso una serie di documenti desecretati Stinnett mostra una serie di fatti che sembrano paventare appunto questa idea: gli Stati Uniti hanno venduto petrolio al Giappone in quantità sufficiente a far iniziare loro la guerra, ma non abbastanza per permettere loro di vincerla. C'è anche da dire che mi sembra un rischio enorme perdere quasi per intero l'efficienza e l'operatività della Flotta del Pacifico, per far entrare la nazione in guerra ... ma bisogna anche considerare la volontà di isolazionismo che si era impadronita degli Stati Uniti. Using the Freedom of Information Act, Pacific theater veteran Stinnett researched the Japanese attack on Pearl Harbor and presents strong documented evidence that the attack was not a "sneak attack" but part of a well-orchestrated plan to galvanize the American people to support the United States entry into World War Two. At the core was a plan to pressure the Japanese into their actions. Also involved were the shifting of personnel and resources to make our defenses more vulnerable, and the leg Using the Freedom of Information Act, Pacific theater veteran Stinnett researched the Japanese attack on Pearl Harbor and presents strong documented evidence that the attack was not a "sneak attack" but part of a well-orchestrated plan to galvanize the American people to support the United States entry into World War Two. At the core was a plan to pressure the Japanese into their actions. Also involved were the shifting of personnel and resources to make our defenses more vulnerable, and the legion of intercepted messages that telegraphed the attack. Lacking narrative coherence, repetitive and scattered, the text is tantalizing nonetheless. The author did his research, culling routing slips from archives which Congressional investigators ('45-'46, '95) overlooked. It becomes clear in the first couple of chapters that the attack on Pearl Harbor was not a surprise...to those in the know. For political reasons, Army and Navy chiefs in Pearl Harbor were deliberately kept in the dark while lower-ranking intelligence officers forwarded intercepts Lacking narrative coherence, repetitive and scattered, the text is tantalizing nonetheless. The author did his research, culling routing slips from archives which Congressional investigators ('45-'46, '95) overlooked. It becomes clear in the first couple of chapters that the attack on Pearl Harbor was not a surprise...to those in the know. For political reasons, Army and Navy chiefs in Pearl Harbor were deliberately kept in the dark while lower-ranking intelligence officers forwarded intercepts to Washington detailing Japan's strike plan. In a fairly alarmist tone, the author shows just how much Roosevelt and members of his cabinet knew about the Pearl Harbor attack before it happened. He claims, and I am prone to believe him, that Roosevelt and others allowed the attack to occur in order to arouse patriotism and interest in the war. Otherwise we would have not entered when we did...if at all. I believe there are groups in high places in politics and the media who do the same things today. I think that FDR didn’t know in advance. Stinnett provides a lot of documents but alas no smoking guns. and David Kahn (author of Codebreakers), are telling: take Stinnett with a grain of salt. It was interesting and our government has always proven themselves untrustworthy but I cannot imagine we would let this happen although I do believe we were provoking Japan and needed an excuse to get involved in WWII. Not the best written but then the subject is rather dull because it is basically poring through documents and trying to tie them together. Does he succeed? Not sure but it is food for thought. Did President Roosevelt know of the impending attack on Pearl Harbor and cynically not inform the commanding officers at Pearl Harbor, Admiral Kimmel or General Short, to get the USA to declare war? The author builds a strong case that this is exactly what happened. This is a very detailed book, more for scholars and specialists in the field, than the lay reader. The author of necessity must overwhelm with detailed evidence as he builds his court case for his theory. A fascinating book that offers evidence that FDR provoked the Japanese and then allowed the Japanese to attack Pearl Harbor. There are some amazing revelations made that shake the very foundations of what we know about the attacks. A must read for anyone interested in World War II, World / American history, or how America goes to war. This book is very interesting. It's meticulously researched and the paper trail is there, and the author proves his point. My only complaint was that it could be a bit dry at times. Otherwise, highly recommended.